MACOMB, Ill. -- Slick roads due to ice and snow played a part in a one-vehicle crash that killed a 23-year-old Keithsburg, Ill., woman Tuesday morning, the Illinois State Police said. Officials said Amber M. Henshaw was driving a 2007 Chevrolet Malibu east on U.S. Highway 34, about 1 1/2 miles east of 140th Street -- Cameron Street -- in Warren County at 8:03 a.m.
Henshaw, state police said, lost control of her car due to ice and snow on the road, sliding across the eastbound lanes of traffic. The Malibu went into the grass median, striking the grass ditch before overturning. BURLINGTON, Iowa - Amber M. Henshaw, 23, Keithsburg, died Tuesday (Dec. 23, 2008). Graveside service will be at noon Monday in Oquawka Cemetery. Visitation will be 11 a.m. to noon Monday at Turnbull Funeral Home, Oquawka. Memorials may be made to the Muscular Dystrophy Association. 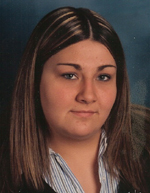 Amber M. Henshaw, age 23, of Keithsburg, passed away on Tuesday, December 23, 2008. She was born on October 14, 1985, in Burlington, Iowa. She is the daughter of Allen Ray and Elaine Renne Mehaffy Henshaw. She was reared and educated in the Westmer area, and graduated from Westmer High School in 2004. She was a certified First Responder in Henderson County. Amber worked at the former Clark Station in Oquawka for several years. She was currently employed at the Wal-Mart Super Center in West Burlington. Amber enjoyed playing online games, chatting with her friends, talking and texting on her cell phone, and spending time with her niece and nephew. Surviving Amber are her parents, Allen and Elaine Henshaw of Keithsburg, two sisters; Tracy Wade and Don of Oquawka, Misty Henshaw and Tony Newton of Keithsburg, one brother, Allen Henshaw, Jr., of Keithsburg. Also surviving is one niece, Leighanna Henshaw of Keithsburg, one nephew, Payton Henshaw of Keithsburg, and grandparents, Harold and Velma Henshaw of Oquawka, Carl Mehaffy of Jonesville, Virginia, and Betty Cook of Oklahoma, and several aunts and uncles, cousins, and her dog, Peanut. She was preceded in death by her uncle, Steve Jones of Oquawka. A graveside service will be at 12:00 p.m. Monday, December 29, 2008, at Oquawka Cemetery. Friends may call at Turnbull Funeral Home in Oquawka from 11:00 a.m. till the time of service at noon. A time of fellowship will follow the service at the Oquawka Eagles Club. A memorial fund has been established for the Muscular Dystrophy Association. For more information, please visit, www.turnbullfuneralhomes.com. Amber M. Henshaw, 23, of Keithsburg, Ill., died Tuesday, Dec. 23, 2008. Born Oct. 14, 1985, in Burlington, she was the daughter of Allen Ray and Elaine Renne Mehaffy Henshaw. Miss Henshaw worked at Wal-Mart Super Center in West Burlington. She worked at the former Clark Station in Oquawka, Ill., for several years. She was a certified first responder in Henderson County, Ill. She was reared and educated in the Westmer, Ill., area, and graduated from Westmer High School in 2004. She enjoyed playing online games, chatting with her friends, talking and texting on her cell phone, and spending time with her niece and nephew. Survivors include her parents of Keithsburg; two sisters, Tracy Wade of Oquawka, and Misty Henshaw of Keithsburg; one brother, Allen Henshaw Jr. of Keithsburg; and her grandparents, Harold and Velma Henshaw of Oquawka, Carl Mehaffy of Jonesville, Va., and Betty Cook of Oklahoma. Visitation will be at 11 a.m. Monday at Turnbull Funeral Home in Oquawka. The graveside service for Miss Henshaw will be at noon Monday in Oquawka Cemetery. A time of fellowship will follow the service at the Oquawka Eagles Club. A memorial has been established for the Muscular Dystrophy Association.